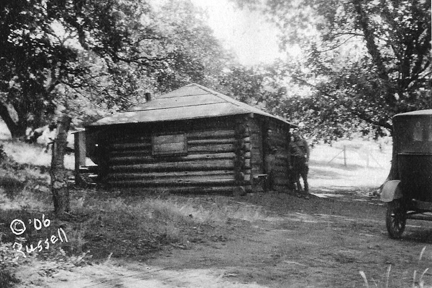 Photo 31 The summer Quarters of The Laguna Ranger of the U.S. Forest Service, Descanso District, Cleveland Nat'l Forest in the early 1920's. This building burned down. The one standing now is a replica. Photo 33. Bottle Peak Lookout. U.S. Forest Service, Descanso Dist, Cleveland Nat'l. Forest. Bottle Peak was a secondary. Lookouts of this description were needed to see into blind spots for primary lookouts such as Boucher. 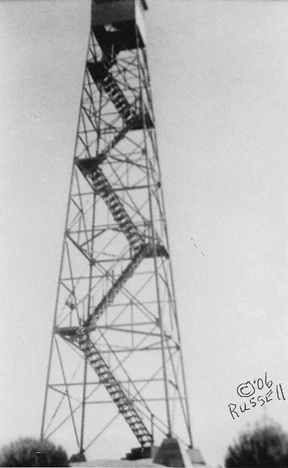 All lookouts during WWII were Aircraft Warning Stations. Photo 34. High Point Lookout, U.S. Forest Service, Palomar Dist. Cleveland Nat'l. Forest, located on the NE corner of the Palomar Mtn's. 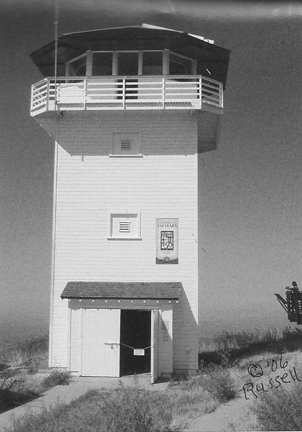 This was a primary lookout and is still in operation. Photo 35.Cuyamaca Lookout U.S. Forest Service, Descanso Dist., Cleveland Nat'l. Forest. 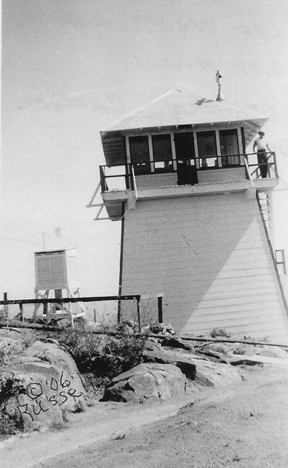 This lookout was a primary lookout, but no longer exists. Photo36. 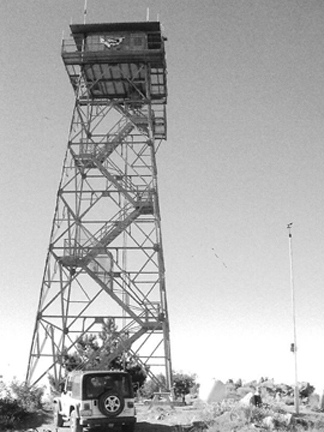 Boucher Lookout, Joint with California State Park System and the U.S. Forest Service. Boucher is located on the SW corner of the Palomar Mtn's. 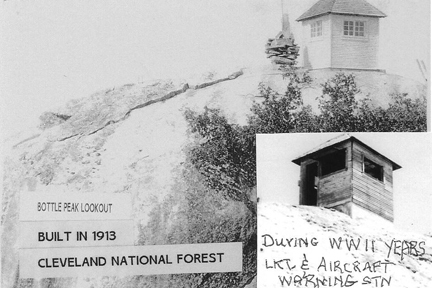 Boucher and High Point lookouts have been operated by the National Forest Fire Lookout Association, a volunteer group, for the last several years. Photo 37. 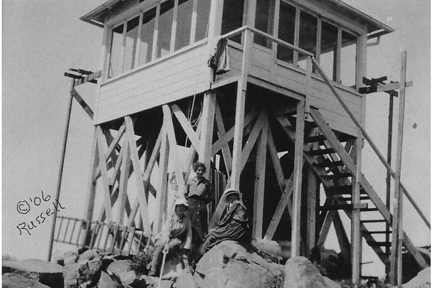 Tecate Lookout, California Department of Forestry. This lookout was located on the U S/ Mex. border just west of Tecate, Mexico about one quarter mile inside the U. S. A. It was a primary lookout, but no longer exists. Photo 38. Mt. Woodson Lookout, California Department of Forestry. Located on Mt. Woodson about seven miles SW of the Town of Ramona, Ca. Photo 39. Mt. Woodson. 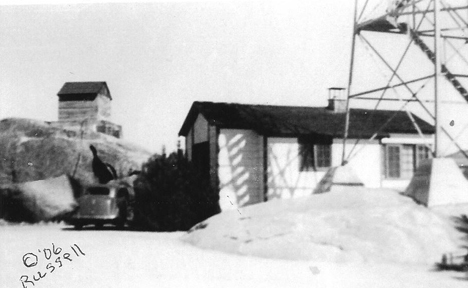 This was the residence for tower personnel (tower was 6 ft. square.) The building on the rock was the water tank. This was a primary lookout, but no longer exists. Photo 40. 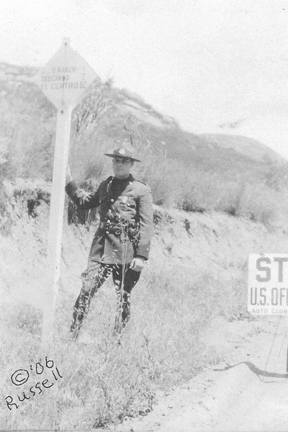 U.S. Border Patrol. The Officer is Roy Newport. This is on Old Hway. 80 near Japatul Valley Rd. NOTE: The sign is by the Auto Club of Southern California. 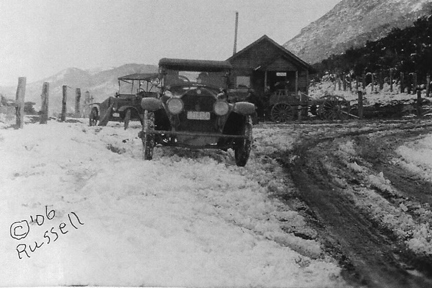 In the day, all road and Highway signs were by the Auto Club.